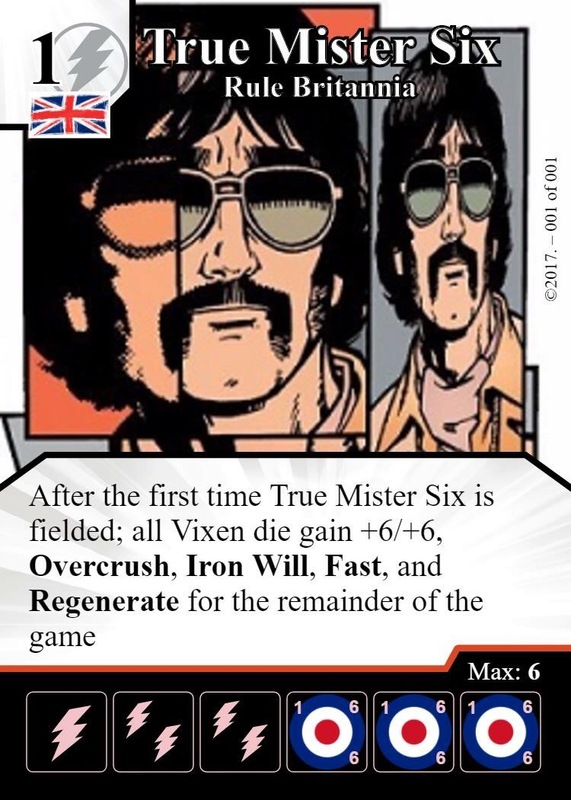 Welcome back folks to our first full episode of the Brit Roller Six podcast. We are super-excited to get this out to you all! The new podcast title will be in effect for the next episode – keep an eye out in case you need to re-search for us if you use a third party Podcast app to subscribe. The Brit Roller Six podcast is published every two weeks on a Monday – keep your eye on the countdown timer in the sidebar for a heads up on upcoming episodes. I didn’t really go into much detail about the two starter teams we discussed on the podcast, so I thought I’d put them here with a brief description about them. The idea is to have 2 teams themed around The Avengers and The Justice League, therefore they absolutely have to incorporate the famous members of each. So a version of Iron Man, Capt. America, Hulk, Black Widow and Hawkeye had to be in the Avengers whilst the Justice League had to have Superman, Batman, Wonder Woman, Aquaman and, yes, I suppose The Flash. Woman and Batman in the set so the idea of the team is quite simple and hopefully one that will be figured out in a few games by the new player. The broad overview: get Aquaman first to make purchases cheaper & get Wonder Woman to make them easier to field. From there; Zatanna gives you some nice ramp and, if Batman gets out, repeatedly fielding and cycling her gives some nice damage and life gain. Superman is there as he’s a rock and I like the card. It gives a reason for the opponent to buy Polymorph to remove him, which is one of the reasons I put it on the team. The Avengers team revolves around Nick Fury. He sets you up to be able to field the others for free which leaves energy to buy buy buy other characters quickly and flood the field. Black Widow – Natasha was one of my favourite cards when I first started playing, but she was soon totally overshadowed by the awesomeness of Tsarina. She fits into the team well but is not overpowered, which is just right for the level I’m going for with these teams. Using things like Teamwatch on Hawkeye and Hulk with Assemble shows some synergy in the team and a reason to cycle the Black Widows. Magic Missile is there to show how pinging off both your opponent’s and your own sidekicks can be beneficial, and Wasp to show how this can be countered. A little note: I hate to ask, but the blog & podcast is now starting to generate a small amount of admin cost and we need help to keep it going. If you enjoy reading the content & listening to our work then please, if you are in a position to help, make a small donation by clicking the ‘Donate’ button in the right hand sidebar. We’re also ambitious, and there’s so much yet we can do to improve the experience, it’s just that the improvements come with a price tag. So, if you can, please give a little helping hand & pitch in a bit. Love the show so far, as someone who only plays Dice Masters at home with his kids could you elastin what you mean by modern and golden please? A feature on drafts and tournaments etc would be good as well so we know what to expect if we sign up for one. Sure thing. Here’s a link to the Wizkids site that explains the ‘Modern’ and ‘Golden’ distinction, but in short – they are two different tournament formats; Golden are tournaments where teams can use any card from any set, and Modern tournaments can only include cards from sets post War of Light. Love the idea of a dinosaurs set. T-Rex vs BEWD – the match of the century. That sounds cool. Tell the store owner to get in touch and we’ll give him a call out and promote his family sessions. Great second episode lads! I’m humbled to have got in the top 5 for the naming comp 😀 Despite having never played dice masters I still really enjoy your musings. I’ll be in touch to remedy my dice masters virginity however. As for historical dice masters; you can totally have villains! Hitler, Stalin, Pol pot, Adelle; the options are endless. When fielded, immediately KO target President. Well done. If Bruce-y had more international appeal we might have gone for it. Congrats to the winner! Love the name! You guys are a delight. Andy had me going with the new IP.